SEVASTOPOL, Ukraine -- Russian nationalists in Crimea have burned Ukrainian history textbooks to protest what they say are distortions of the past by the administration of former President Viktor Yushchenko. The recent transfer of power in Kyiv has raised hope among Russian nationalists and fear among Ukrainians. 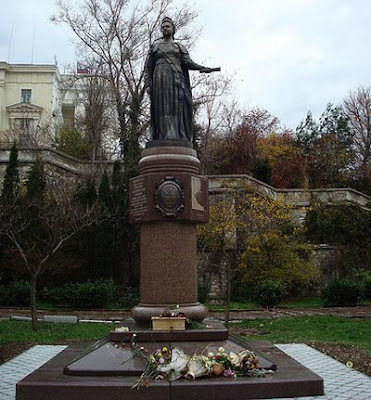 Statue of Catherine the Great, in Sevastopol, where book burning took place. On Sunday, Russian nationalists in the Crimean port city of Sevastopol, home to Russia's Black Sea Fleet, threw Ukrainian history textbooks into boxes at the foot of a local monument to Russian empress Catherine the Great. The books were to be turned into pulp. More history texts were burned the following day at another demonstration in Simferopol, the capital of Crimea. Among the participants was Sevastopol city councilman Yevgeniy Dubovik, a member of the pro-Russian and far left Progressive Socialist Party of Ukraine. He agrees with the warning of 19th century German writer Heinrich Heine who wrote, "Where they burn books, they will in the end burn people." Nonetheless, Dubovik told VOA that Monday's burning of Ukrainian history books was justified. Dubovik says his group burned literature that promoted fascism in Ukraine, and they will continue to burn and trample it. He condemns the books, saying they seperate people and destroy the mutual love between Russians and Ukrainians. Dubovik adds that perhaps even toilet paper will be made out of the books. He acknowledges the chosen method may be harsh, but thinks it is the right one. Unlike history texts promoted by former President Viktor Yushchenko, those of the Soviet era ignored or condemned Ukrainians who fought against Russian or Soviet imperial rule. Pro-Russian forces also resent Mr. Yushchenko's campaign to teach the Ukrainian language to schoolchildren in Russian-speaking regions of the country. Another bitter point of contention is the former president's decision to have young Ukrainians learn about the so-called Holodomor, a Kremlin-inspired famine more than 75 years ago that was aimed at collectivizing Soviet agriculture. The tragedy claimed the lives of millions of Ukrainians and other Soviet peoples, including Russians, Belorusyns, Moldovans, Crimean Tatars, Kazakhs and Jews. Any mention of the Holodomor was strictly forbidden in the USSR. Yevgeniy Dubovik says there is no point in dwelling on the past, because everyone knows about the famine anyway and life after collectivization was fine. Protest organizers in Crimea say they are counting on newly elected President Viktor Yanukovych to downplay Ukrainian history and language and to improve ties with Moscow. Meanwhile, many Ukrainians, particularly in the western part of the country, fear controversial new Education Minister Dmytro Tabachnyk will promote pro-Russian policies. Tabachnyk has raised eyebrows with statements that suggest western and eastern Ukraine should be separated, or should never have been united in the first place. In a protest against him on Monday in the city of Lviv, Ukraine's Congress of Young Nationalists collected old Soviet history books to turn them into pulp. The organization's local leader, Andriy Ben, rejects broad Soviet-era accusations that western Ukrainians were all Nazi war collaborators. He told VOA he is willing to discuss ways to discuss the apparent divide over Ukrainian history with opponents in Crimea. This divide, says Ben, is exacerbated on purpose by politicians who play political games. The activist believes there is actually no gap among ordinary people. As for Tabachnyk, Ben says petition drives are being held against him, not just in western Ukraine, but also in Kyiv and such eastern and southern cities as Kharkiv, Kherson, and even Odesa. Mr. Tabachnyk was not available to comment about the controversy surrounding his appointment or the book burning. The president of the prestigious Kyiv Mohyla Academy, Serhiy Kvit, is among the new Education Minister's prominent critics. Kvit told VOA the recent destruction of books in Ukraine is not so much a tragedy, as it is a farce. He adds that the Tabachnyk controversy is a teachable moment made possible by freedom on speech. The university president says if anyone tried to eliminate freedom of speech, which Ukrainians enjoy on news programs and talk shows, he would have very big problems. Kvit says Ukrainians today openly discuss and express everything, which is the main achievement of the [popular 2004 protest known as the] Orange Revolution. Kvit adds that most contemporary Ukrainian politicians are heavily influenced by Soviet-style thinking, but even they understand the reality of free speech in Ukraine, which remains despite changes in government. Serhiy Kvit and other leading Ukrainian university officials have posted arguments against Tabachnyk on the Internet, where the Minister's critics have also created a special protest page. More than 800 people have joined a Facebook group that opposes his appointment.